I’m from Germany, and I’ve been a fan for many many years. I met the man himself personally in 2005, I was just parking my car outside the arena, when I saw people running towards a fence. I grabbed my copy of Nebraska and started running. And there he was, standing at the other side of the fence and gave autographs for about 15 minutes. A lot of people asked him for requests. One wanted to hear Backstreets but Bruce just showed his hands and said, “Those are not the fingers” refering to his “restricted skills” at the piano. When he was near me I asked him to play “I wish I were blind”. He stopped, looked me right in the eye and said “That could be an idea” I was overwhelmed and nearly forgot to give him the Nebraska album! But he signed it and even shook my hand. At the middle of this great concert he sat down at the piano and said ” Alright, let’s see how this goes. I got a request for this one from somebody out back. First time, I’ll give it a shot. I haven’t done this one in a while. Let’s see.” And then he started to play one of the most beautiful versions of this amazing song and all I thought was “Allright, now I can die”. On December 13th 2007 me and my girlfriend were at the concert in Cologne, which is her hometown. I waited for a song that was suitable for the occasion and when the band played “Because the night” I made my marriage proposalto her. For sure I’m the only guý who had to yell at his proposal, but she said yes and we are happy and have two great kids, and we settled on the name Frederick as a second name for our boy. And finally the Concert in Hannover. 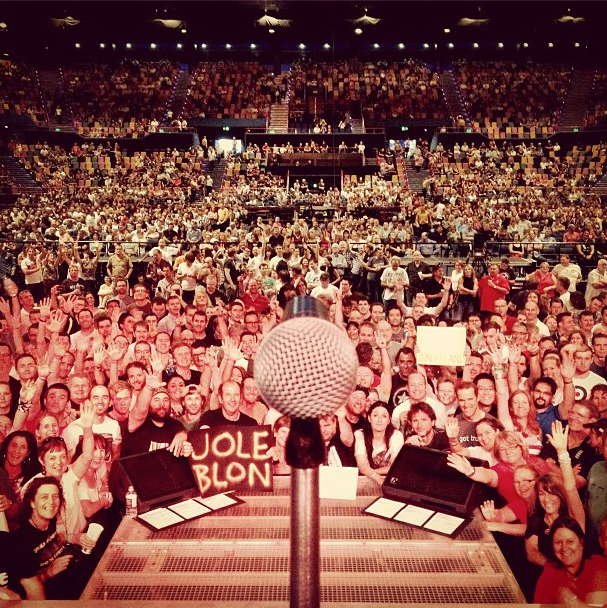 We had a couple of signes for our three shows in Germany but I decided to go for Drift away and Roll of the dice. 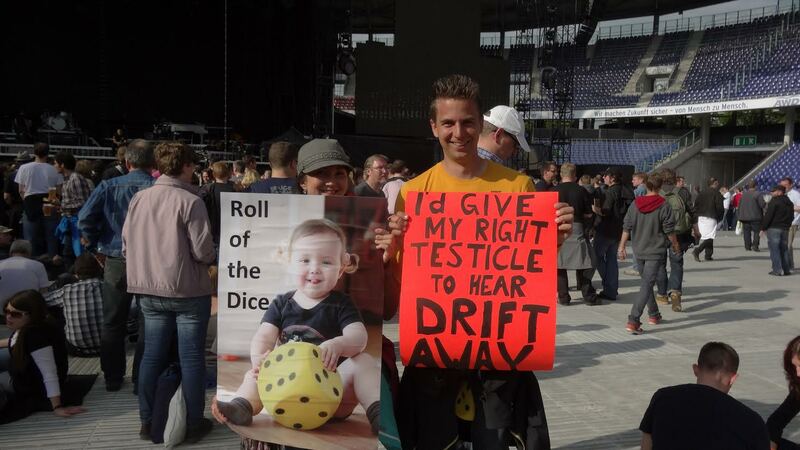 The first request said: “I’d give my right testicle to hear Drift away” and the other one had a picture of my two year old daughter with a dice. 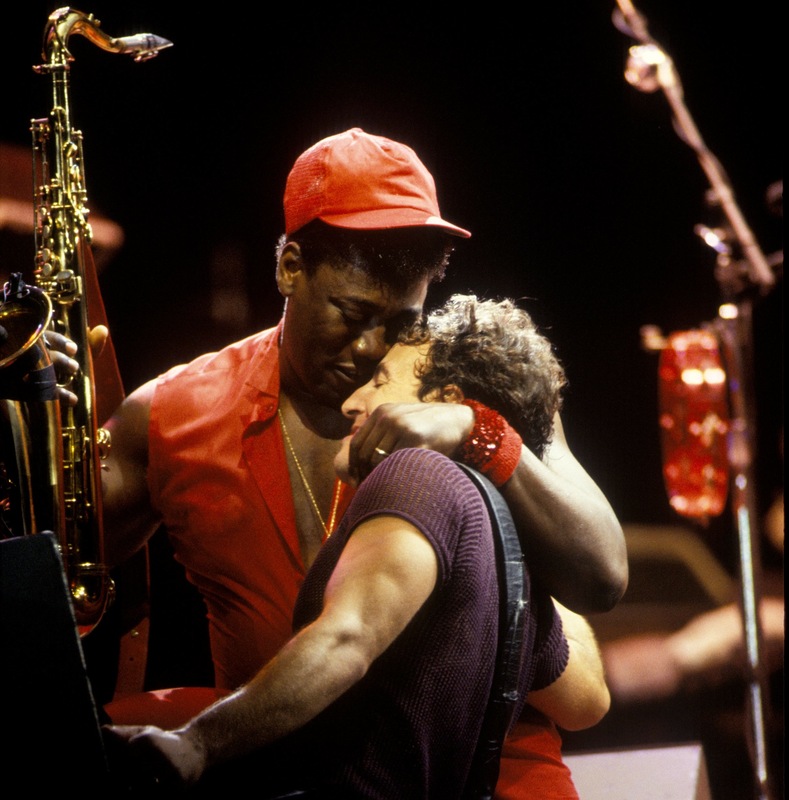 Bruce saw the request that offered my testicle and took it. I was more than happy with that, but kept the other sign up. He stoped singing and looked at the sign with my little daughter on it and started to laugh. He took it as well and went back to the middle of the stage. 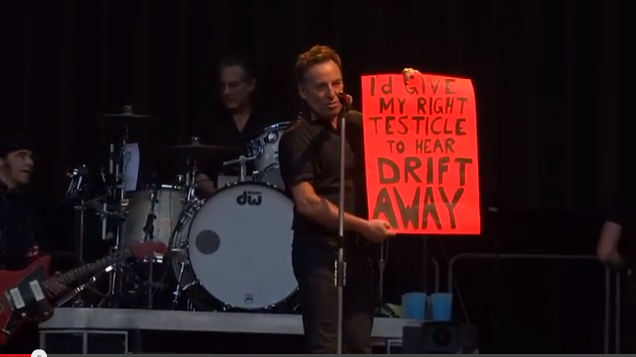 After finishing the song he took my sign for Drift away and made some jokes that he would play it if he didn’t have to see either my right or my left testicle. I could live with that! 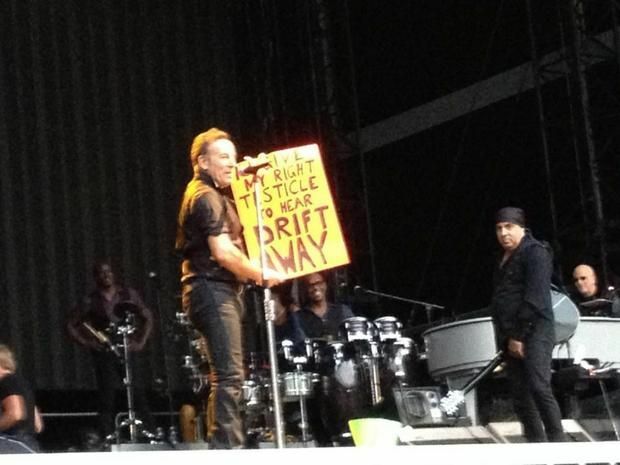 After the encore break Bruce came out and brought the sign with the picture of my little girl and another request for Roll of the dice build out of a dustbin and some dices. Although I would have wished for a full band version I was totally satisfied with the beautiful solo acoustic version of Roll of the dice! I think I’m damn lucky that I got three requests played. I’m looking forward to the next tour and I already got some pretty good ideas for some weird signs request! A big hug to every fan out there!